I do not think it is a bad film, but neither is it an enticing film or a must watch. Every Eid, superstar Salman Khan presents the audience with a keenly awaited gift – a blockbuster film starring him. His legion of fans around the world wait with bated breath for these films, willing to devour them, whether they have substance or not. Such is the aura of this actor that he could do anything, and it would turn out to be a blockbuster. 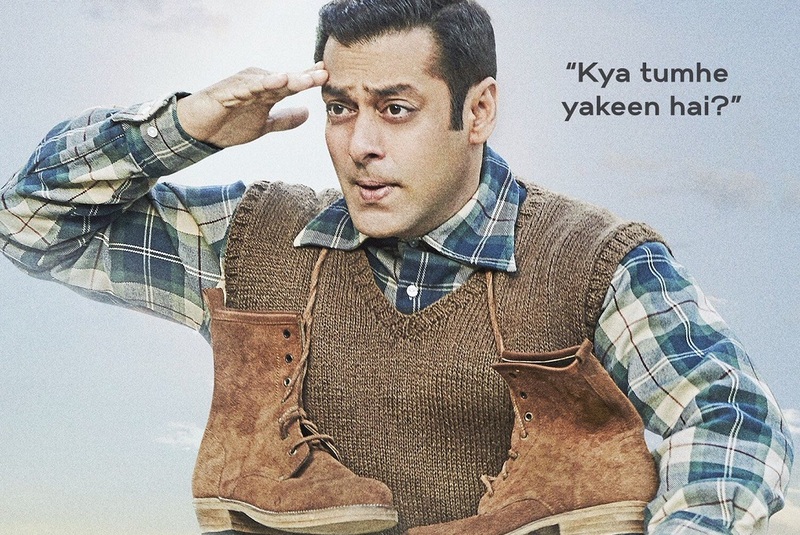 Tubelight tells the tale of Laxman Singh Bisht aka Tubelight (Salman Khan) who shares a very close bond with his younger brother Bharat (Sohail Khan). When war breaks out between India and China and Bharat is drafted into the army, a broken hearted Laxman anticipates his brother’s return. During the course of this wait, Laxman also befriends an Indian woman of Chinese descent (Zhu Zhu) and her son Guo (Matin Tingu). A series of twists and turns overcome the events of the war and Laxman is left with the one thing that he believes will bring his brother back – hope. Will Bharat return? Will Laxman be able to protect Guo and his mother from the wrath of some prejudiced townsfolk? Watch Tubelight to find out. Salman Khan has to be lauded for the change he has given to his career. He has moved beyond formulaic masala films and has given us some of his best work over the past two years, starting with Bajrangi Bhaijaan and then moving to Prem Ratan Dhan Payo and Sultan. Tubelight is in the same filmic space, with a more mature story then what Salman is known for or what people associate his stardom with. He has become a much better performer in emotional scenes then what he had done in the initial days of his career. Although I would not say that his performance in this movie is flawless, it is very sincere and you can see that he worked very hard on it. I hope that he continues to experiment with more roles like this one and I hope that one day he surprises the audience with such a brilliant performance that he wins both box office and award laurels. Kudos to him for attempting a role like this. Sohail Khan performs brilliantly in the movie. This is definitely his best performance and he performs like a pro. Although his role is not very large, it leaves an impact and this just proves that when you have a good director, you can do anything. Zhu Zhu and Matin Tingu as the Chinese descended mother and son put in heartwarming, honest performances. Zhu Zhu has complete control of her emotions and not once does she overact. She has a grace and vulnerability to her, which makes her character very likable yet mysterious at the same time. She has a pretty large role and she does complete justice to it. Matin is adorable as Guo. Children are often better actors than adults, because of their honesty and innocence. Om Puri, in his final film role, is stellar. What words could I possibly say about this man? He will always be a legend and have a special place in the hearts of moviegoers for years to come. Yashpal Sharma performs very well as the army general. I would like to give a special shout out to Mohammad Zeeshan Ayyub, who is becoming a rising star in his own right. This guy is amazing in every performance that he does, and here he once again steals the show in a grey performance as Narayan. He is a star in his own right! The music by Pritam works well in the situations but nothing is super memorable besides the song “Radio”. The editing leaves a little to be desired because the pacing of the film is quite slow, when compared to Kabir Khan’s other films. I heard they chopped off 20 minutes of the movie before release, and I think that was a good decision. There was probably even more that could have been removed to make it tighter, but alas the movie still feels 30-40 minutes too long. The cinematography of the film is a major highlight, with lush colors and beautiful locales. Makes for a visually rich experience! Now to the writing and direction, what is interesting here is that there is a discrepancy between these two aspects of the film. Kabir Khan’s direction is phenomenal. There is nothing cheesy here (the emotions are more believable than the extremes that Bajrangi Bhaijaantook them), and the performances for the most part are believable. It is the writing that I question here. There simply is not enough material in this story to make it an engaging experience. The overall theme of “hope and belief” does not come across convincingly, and ultimately, as my sister said, leaves no impact. I wish the writers had come up with a way to tie that theme in a stronger manner in the script, so that at the end, you really believe in the message. However, in the scramble to create situations to keep the movie going, the theme gets lost and forcibly resurfaces in certain moments of coincidence and convenience. This was particularly disappointing because I have seen the entire body of work of this director, who has made some of the best Indian films, but here I guess in the effort to try and build a story from a flimsy idea, the writing got lost. On the one hand Tubelight has an interesting topic behind its genesis, but ultimately it is not depicted and explored properly. There was great potential for this to be as impactful and as emotional of a film as Bajrangi Bhaijaan, but it does not quite get there. I do not think it is a bad film, but neither is it an enticing film or a must watch. It is a case of an experiment gone somewhat awry. For this, I give it a 2/5.